I got a surprising email out of the blue, from someone looking for the copyright holders of a poster created years ago called “Freeing South Africa, freeing ourselves.” Was I the Axie Breen listed as co-designer on this poster? Yes I was! They were looking for permission to include it in an interactive exhibition at the National Museum of African American History and Culture, which was just about to open in Washington. The poster was a protest against apartheid in South Africa, commissioned as a gift for Desmond Tutu’s visit to Chicago. My colleague Nori Davis made the artwork; we came up with the idea together. This was one of the first design offices I worked in, and Nori was a big-hearted activist, a strong influence on young me about designing for good. She would be so thrilled that our poster has found a place in this museum! 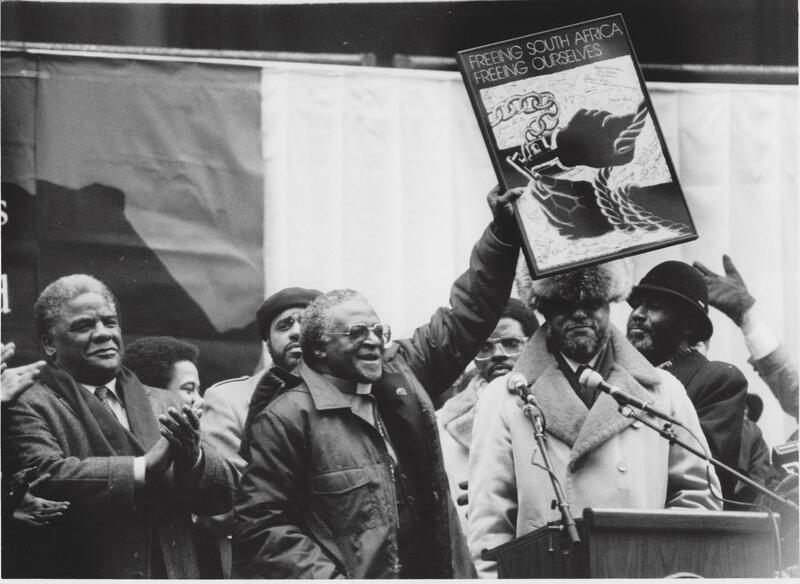 Photo: Mayor Harold Washington presents Archbishop Tutu a gift from the people of Chicago to the people of South Africa.